“My experience thus far working under FSU Department of Art Professor Kenneth Von Roenn in the Master Craftsman Studios has truly been an eye opening experience. Through this internship I aspired to gain added artistic experience early on in my academic career. I have always had a passion for art but it wasn’t until I traveled to Europe in 8th grade when it really bloomed. By traveling across the globe I was able to acquire a distinct appreciation for differing cultures and customs. I was able to observe the everyday beauty and art that reveals itself when one is plunged into a foreign land in which you must look at your surroundings with fresh and naked eyes. The subjectivity and endless interpretations of artistic pieces opened my mind to a realm ungoverned by the traditional and formulaic perspective in which we are conditioned to view the world. During this internship I was able to further explore my passion for different cultures around the world. 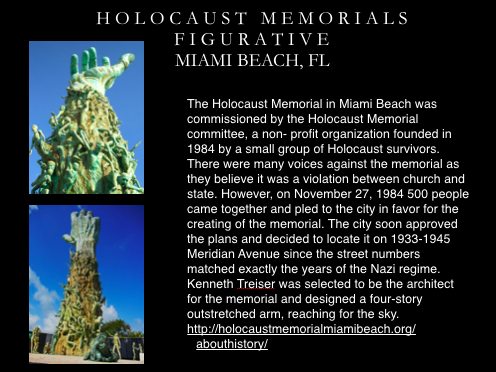 The subject which we were asked to undertake was a brief history on the creation of different Holocaust Figurative Memorials across various countries. Tallahassee Legislatures are planning on constructing Tallahassee’s very own Holocaust Memorial and thus asked Master Craftsman’s Studio to put together a PowerPoint of 30 different Holocaust Memorials in order to gain inspiration. 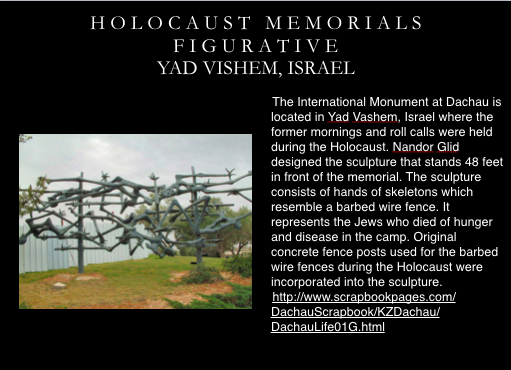 For my personal assignment I was asked to preform research on 15 of these Memorials and write a summary for each slide. This PowerPoint will allow the Designers and Legislatures to obtain the knowledge on the different artistic perspectives taken on their construction. Through this assignment I particularly enjoyed learning about the history behind the unique sculptures designed by different artists for the Memorials. Each structure was created using various mediums and expressed a distinct interpretation of the genocide. Moreover, though this research I also enjoyed learning more about the history regarding the Holocaust. Each Memorial not only contained a remarkable sculpture but additionally unique stories behind their location, creation, and building. 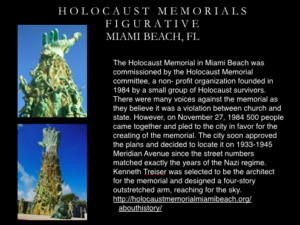 Learning about these different Memorials allows us to develop an awareness of the oppression of others and understand the ramification of prejudices in society.